After adding up the mileage from the log book I keep with the Vardo, I see we have clocked over 21,000 miles since she was first put to the road in February of 2010. I have, no doubt, missed some small side trips and there are excursions I know I forgot to record, but this is, more-or-less, where we stand. The trailer frame itself was high-mileage but well-maintained when I acquired it back around 2002 having first been owned by a university, then by a private individual before coming to me. My “before” photo. Rated at 2,000 lb. gross vehicle weight. It was solid and well-built but already showing some signs of age and life in the salt air of the Pacific Coast. The real beauty of this trailer is the square tube construction and heavy-duty hitch. Starting small was wise for me as it constrained the build and forced me to squeeze every inch out of the design. On the way to becoming the “after” photo. The full box body nearly done. I eventually replaced the original jack with a more heavy-duty model and replaced the jack wheel with a large foot for stability. For safety, the tires were replaced when the trailer was re-purposed due to age, not wear. If you missed it and want to read more about the construction of the micro house we call a vardo, GO HERE. The Vardo; Where are we now? What do we want? This little living wagon is great and serves it’s function well. It’s a little beat up and showing it’s miles; living and traveling in all weather, a lot like it’s owner. But still, it’s a little homey shelter from the elements, providing all the necessary comforts, and making travel a breeze. With about 49.5 square feet of living space inside (4.6 sq. meters) it is spacious for one and comfortable enough for two adults who do most of their activities outdoors. However, I have long pondered placing my vardo on a longer trailer, either to gain cargo space for tools and the like OR to extend our living space. Sticking with the Minimalist thinking, I decided long ago that 12 feet was about the maximum I want in a trailer. With a standard 4 foot hitch that makes for 16 feet (4.9 meters) dragging behind the truck or about the length of a second truck. I did the math on the new space and I liked it. So back to it. What do we really need? Thinking of the many scenarios we find ourselves in, some added amenities could be handy in certain situations. From wilderness areas in Utah to posh campgrounds in San Diego, highway rest areas in the Midwest and museum parking lots in Santa Fe, or even stealth camping on a city street, our needs are varied. Although the vardo was built as a wilderness base camp, sometimes it feels like a miniature fortress or space station or temple of solitude. When we’re camping in the remote west, beyond the confines of civilization and snooping gawkers, it’s not a problem spending most of our time outdoors, using a campfire or cook stove to fry up some bacon and boil some coffee, but try that in a grocery store parking lot in the city and you will only find trouble. But we still essentially live outdoors. We don’t need a dance floor inside. A simple kitchen. By this I don’t mean a Martha Stewart style, butcher block countertop with rotating spice racks, dual ovens and a six burner ceramic-top range. We need a dedicated space to store our cookware and food, do some prep-work, and make simple meals in any weather, beyond the prying eyes of the local gendarmerie. Secondly, we want more storage space for our personal belongings when we finally hit the long open road and don’t look back. Tools for making things and raw materials alone take up a lot of our space. Leather, wood, sewing supplies, fasteners, etc. all require more space than we have. On top of this, a large, flat work surface would be a nice addition indoors. After several (many) sketches and mock-ups… Voila! I think we nailed it, the vardo formerly known as the Snail reborn as Nautilus 78. Even though we know that nothing comes from nothing, our minds like to think of things as having a beginning, middle, and end. So in that sense, here’s to our new beginning. The new foundation. Tandem wheels, brakes, breakaway safety system, LED lights and 7,000 GVWR. Let’s hope we’ll never need this much trailer. Too many badges, certificates and insignia. Still, and excellent buy I think. First things first. The heavy wooden floor must go. Looking forward to seeing this one take shape. I did get a start on mine, the walls are up, bunk in, but time and circumstance has put the project on the back burner. Awesome! Google Parkliner fiberglass trailer, it’s what I have. Trailer is 15ft end to end 12ft inside. The designer added wraparound cabinets along the ceiling holds a lot of stuff….when I build a small cabin that is my plan. Best of Luck! Sounds cool Deryk. I hope your cabin goes well too! This is great! I am still researching and planning my own. Your thinking and building have been both the most usefully detailed and the most inspiring of all of my sources. I had already decided on something bigger than the Snail, so I’m really looking forward to this latest project. Looking forward to following the new build! Looking forward to following this along — that is about the size I’m hoping to build someday. What will become of the current one? Wow, that’s important news. I’ll pass that on. Tandem axles and brakes, saves a lot of wear and tear on the tow vehicle, great choice. I have my popcorn and soda, let the show begin! 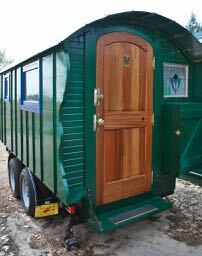 We just started in on Vardo 2.0 as well, and got a trailer similar to yours! Tandem axle and brakes! We just attached Advantech subfloor directly to the trailer decking. We paid for an upgrade to have the trailer decking extra treated for wear and tear, then we laid down 8mil of plastic, then screwed the 3/4″ Advantech to it. I was surprised to see your framed floor, but certainly understand it. However, it made me question the decision we made! Good luck! It will all be good. I just struck the original floor boards for the weight savings. It would have been easier to just attach to the floor boards “as is.” That’s what we did with the one we helped Jack built. You inspired me to finally make my posting! George…thanks for the facebook replies. I am following your remodel with the passion of setter on a fresh pheasant scent, believe me! I am convinced that creating a blog is the correct thing to do once I start my project. After all lets keep “your” traditions alive, and I mean that with all sincerity. Thank you for this blog! News update, as I crunch numbers on my 8 x12 cabin I have figured a way to have room to sleep three with comfort. The port side will have bunkbeds and the starboard a fold out bed. There will be no single large bed. I was just going to put in two single size beds but then the engineer in me said no I need more wall support. Thus the bunk bed came to reality. Thanks a million for this blog…you will be mentioned many times over when my “Trapping/Hunting Vardo” comes to life. Thanks Larry. I’m glad you have got a plan (that’s the hardest part for most of us). Believe it or not, we can sleep up to four in ours when we put the planks between the seats; two in the main bed, one underneath, and one on the cross bench bed. It’s a little claustrophobic for someone under the main bed but can work in a pinch. We reserve that spot for the dog since she seems to be fond of tight spaces. I’m looking forward to seeing your progress. Will you be selling your old Vardo? No, it was integrated and expanded into the new one. It shows how it happened in some of the posts. I may have the old trailer frame for sale. Small but sturdy. $500 currently located in SW Missouri.